Review: Happy Cat Cafe - Sip Coffee, Save Cats! When Kati Palmurkar reached out over email last month I had to do a double take at her introduction: Hi, I'm Kati, owner of Happy Cat Cafe, GR's first ever cat cafe!" Cat cafe?! This being my first exposure to the concept I immediately got on my google machine and guess what, this is a thing. Cat cafes are all over the globe mostly finding homes in larger cities like New York and Tokyo. And the trend doesn't stop there... I found listings for all kinds of cafes: bunnies, puppies, you name it. Like, if there's a snake cafe out there I'm going to lose it. Kati is a self described 'crazy cat lady' and opened Happy Cat Cafe in Fall of 2017 after a successful Kickstarter campaign that raised over $27,000 for starting the business. By opening the cat cafe she was able to mesh two very important things: 1. provide the opportunity to place cats in welcoming homes through adoption and 2. provide for her family. Her husband and business partner, Adarsh, have one very happy baby boy and call Grand Rapids home. When we arrived at Happy Cat Cafe on a Saturday morning for our 11am reservation we were greeted by Adarsh who often works out of the cafe - he's an independent contractor who also helps run the cafe. On that particular Saturday morning it was especially chilly outside so the warmth of the cozy faux fireplace was noticed and appreciated. Adarsh checked us in using the iPad register and gave us a quick rundown of the space: the cost of your hourly rate ($10/hour) includes a beverage and a free snack if you share your experience on social media (i.e. Instagram post). They have K-Cups for coffee lovers, tea and soda, and snacks include the basics: granola bars, fruit and more. The cafe space is separate from the room where you can hang out with the kitties, but you're welcome to bring in your beverage as you visit. That morning the space was hoping with 3 other reservations besides ours. When Natalie saw the cats she squealed with delight - the kid loves animals! I think her excitement scared most of the felines but she was able to pet a few of them and teased them with toys on string. She could have stayed there for hours if we would have let her. The space was very clean which made this neat freak feel right at home. For housing that many cats (between 8-10 on a normal day depending on adoption rate) I would have thought it would be more difficult to keep a tidy space. The room was staffed with a volunteer who pointed out which cats might be good for Natalie to pet, told us their names and even what breed they were. She was very helpful. 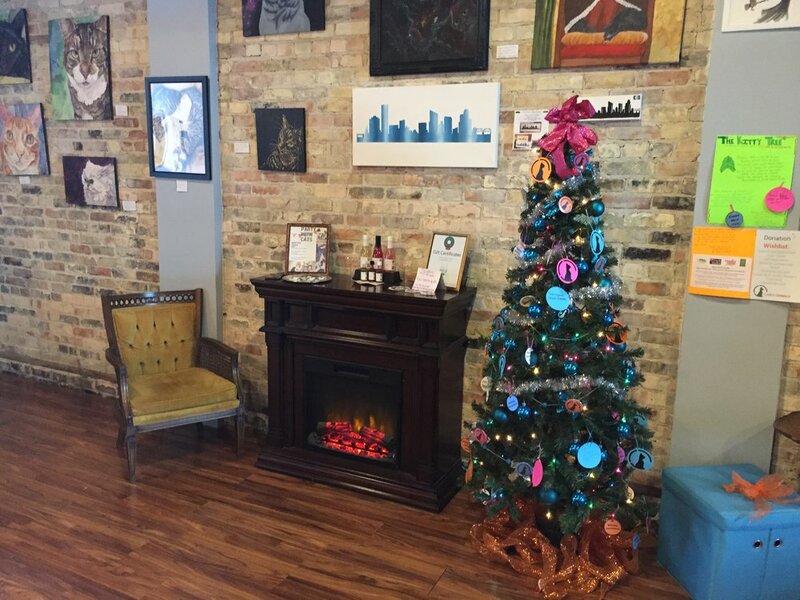 So far the Cat Cafe has placed 50 cats in happy homes around Grand Rapids. I asked Kati if there was one adoption story in particular that stood out to her and she shared the story of Fredricka. Before the cafe, Fredricka had been in a shelter for over 5 years and had been through multiple failed adoption attempts. But the folks at the shelter saw an opportunity in Happy Cat Cafe and through constant reassuring love and patience, they were able to find Lady Fred a home. Happy Cat Cafe also offers special events including Cat Yoga - come to the cafe and practice yoga with cats roaming around you! Kathy Reed, who teaches the cat yoga is fantastic! I've taken a few of her team taught classes at Roots Coffee Shop. They also offer Cats and Canvas - you like cats and painting (and wine), this event is for you. The cafe has easy access parking in the back of their building (making it easy with kids) and you can find their open hours here.